This is to inform all the candidates that applied for the Federal Polytechnic Nekede (NEKEDEPOLY) National Diploma (ND) Evening/Weekend programmes admission that the management of the polytechnic has released the list of candidates offered provisional admission. NEKEDEPOLY ND Evening/Weekend admission List for the 2018/2019 academic year has been successfully uploaded on the polytechnic portal . 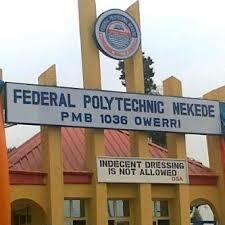 Read : Federal Polytechnic Nekede ND (Morning) Admission List 2018/2019. How to Check Federal Polytechnic Nekede Admission List. Insert your Application Form Numberin the required column. Read Also: Federal Poly Nekede Acceptance Fee Payment Details – 2018/19. Those who did not register for JAMB 2018 are to go to any CBT center and register for JAMB 2018 (Part-time) [you will be requested to pay the sum of three thousand, five hundred naira (N3,500)], after which they are to submit their Jamb Registration number as indicated in (1) above. All candidates who applied for National Diploma (ND, Morning) are to log on their JAMB account at www.jamb.org.ng and upload their O’level results to enable the Polytechnic consider them for admission. This should be done as soon as possible. Congratulations to all the candidates offered provisional admission into NEKEDEPOLY ND Evening/Weekend programmes for the 2018/2019 academic year.